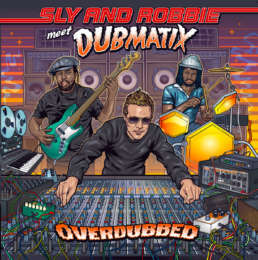 With his highly anticipated meeting with Sly and Robbie just out, Dubmatix kindly took time out of his busy schedule to speak with The Groove Thief about the Overdubbed project, his recent remix work, and how he maintains a successful work/life balance. A full album review follows. TGT: We last spoke backstage at Reggae Sun Ska Festival in 2015, and I actually joked about you being Sly and Robbie! 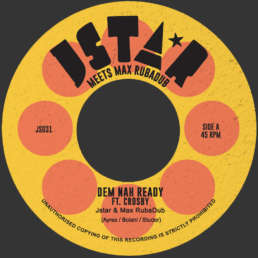 Now this seems like a dubber’s dream: how did this project with them come together, and what was it like actually working in the studio with instrumentals laid down by the famed Riddim Twins? 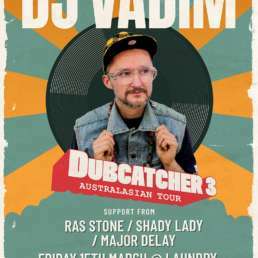 Dubmatix: That’s true – I remember our first meeting – Vibronics was playing and we were hanging out backstage catching his set. The project came together as an idea from Nicolai at Echo Beach Records, based in Hamburg. I was visiting there spring of 2016 and we were talking about cover songs and collaboration projects when he suggested the idea. I jumped at the opportunity. The first step was to do 2 remixes/re-visionings as a sample to provide Groove Attack, the label that has the master tapes. They liked what they heard and the wheels we put in motion. By January 2017 I had all the stems for 11 songs. I spent until October 2017 with the tracks when I finally sent the masters to the Echo Beach. TGT: Overdubbed comes out blazing with “Dictionary” and never seems to slow down, loaded full of heavyweight roots tunes set in a contemporary style. What goals did you have for the sound of the album? And which musical reference points guided your production and arrangement work (or on any songs specifically)? Dubmatix: As the originals were dub, my goal was to strip away everything but the drums and bass of Sly & Robbie and re-build each track into something new – almost entirely different from the originals. Readers can look up the originals to compare. 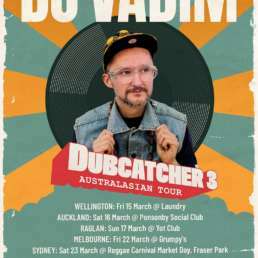 Not focusing on dub, but always keeping dub as my sonic palette – I based the direction of each song on the riddim. Some have a vintage dub/ roots sound, some more future dub, there’s breakbeat and trip-hop – à la Portishead and Massive Attack and Afro-Brazilian drumming and more. Each song has an individual sound and style. TGT: Two cuts here – “Riding East” and “Great Wall” – almost seem to tilt towards China. Were these inspired by Sly and Robbie’s trip to Guangzhou, China a few years back?! Regardless, haha, any interesting context for these tracks? Dubmatix: “Riding East” originally reminded me of a western theme and the first version of the re-visioning I did actually contains Western movie theme sound FX and dubbing. “Great Wall” really came about looking at different grooves that could be layered over Sly & Robbie drum and bass. Again, trying to take it away from traditional dub and seeing where else it could go sonically and musically. TGT: Your studio output of late, particularly your remix work leading into this Overdubbed album release, has continually impressed. To me, gems with Micah Shemaiah, The Hempolics, and Jay Douglas & Chris Butcher stand out in particular. Which one of those 2017 remixes did you enjoy the most? Dubmatix: I really enjoyed all of them. When you look at each – they differ in style, instrumentation, and sonics. Approaching remixes for me is like being in a candy store – I generally remove everything except vocals, horns, and maybe percussion. Then I listen to what’s left and build from there. Micah’s track was a moment I sat down and came up with the idea for a bassline – recorded it in one take, leaving the imperfections and then added the final parts – keeping everything more “live” sounding, no quantizing or editing. Hempolics always come with fresh interesting music and it’s something I really enjoy working on – I can take their tracks and go anywhere I want as their music is very diverse. Jay & Chris – great musicians and as Jay’s vocals really lend themselves well to roots – I kept that in mind as I worked on the remix. TGT: Given all the aspects of music that you are involved with, your schedule is assuredly hectic. What advice do you have for younger artists about maintaining balance, levity, and ultimately creative productivity? Any Dubmatix life hacks? Dubmatix: I’m the type of person that needs to do things. To be creative. To be active. To have a project. For balance I do a lot of cycling, walking, reading, learning and some good old-fashioned couch surfing. For new artists – each person will have a path but some basic things to always keep in mind is – be open, try to work with as many good people as possible, try to get involved and offer to remix things, collaborate with as many people as possible. Focus on quality rather than output. Don’t think about making money when approaching music or trying to improve your skills. Most important – don’t get comfortable. Push and challenge yourself. Try new sounds, limit what instruments you’ll work with. Re-wire your studio. Swap out your go-to gear for different gear. Learn. The opening “Dictionary” swirls in upon a rather rhetorical ‘are you ready?’ sample, until the towering breakbeat-in-roots arrives, heavy yet rolling. By the end of this powerful album it’s clear that the tone was properly set from the very first drop. The drums feel tense, the groove mechanized just so. Then “Smoothie” steps into more vintage territory, horns leading the charge on a scrambling bassline. Prince Alla hits the microphone first, chanting away in his unique ethereal tone, while Screechy Dan and Megative provide nice vocal counterpoints. “Riding East” tilts mythical, until the bass offers up a dominating sense of balance. More hypnotic than the previous tracks, between the wobbles and melodies, this is a nice offering of sound system-inspired dub weight. All drums to start, “Great Wall” is built around a deceptively simply groove. The horn lines snap atop it, true, yet there’s a lot of subtle layers here, all adding up to create a funky, soulful track. Featuring Jay Spaker on the near-falsetto vocal, “Communication Breakdown” begins languidly before developing into another emotive performance. The choice keys pair well with the mournful-yet-optimistic message. The ensuing “Dirty Flirty” initially feels raw by comparison, but the Afro-Brazilian drumming of Pato Irie quickly shifts the vibe over to the dancefloor by way of its entrancing patterns. Indulging in digital dreams, “Great Escape” twists its early pop vibe into lusher territory. Arguably the least reggae-inspired, this is also then the most future-forward beat. “Shabby Attack” brings us back to the dancehall, albeit a late-night haze-laden one that features a rare filter credit, to Jim The Boss. Triumphant horns call on this, a standout, and the bass responds in pulsating fashion; Dubmatix effortlessly conjures an unexpected breakdown, before heading back off into the land of weight. Far sparser – and embracing a dancehall-style intro – “Frenchman Code” meanders in the best of ways, thoughtful yet driven by a pair: bass and brass. A positive message wraps up the track appropriately, ‘change is possible.’ Returning to those late-night hours, “Burru Saturday” is a pounding cut of steppers, a self-proclaimed ‘sound clash killer,’ one that’s willing to step away from its own power before returning as strong as ever. Wrapping up the originals is “Ruff House,” a nice take on vintage roots. The tone is pure while the keys warm the track, creating an ageless sound. The ensuing six tracks – all alternate dubs, mixes, and versions: great for selectors as well as listeners who appreciate the art of the engineer – begin with a Western Mix of “Riding East” that is urgent rather than deep. “Communication Breakdown Dub” gets down in the groove, amping up the potency of the vocals through echo. As an equal partner to the key lines, this is simply a stellar display of board work, and a notable reinvention. Deemed a bonus, this second mix of “Burru Saturday” does concede a hint of electronic dance music, yet also feels more worldly. On both “Great Escape”(Dancefloor Dub) and “Riding East” (Alternate Version), the drums move forward a solid beat, pausing to recollect before beginning anew. A third driving instrumental, a dub of “Smoothie,” brings the album to a close. Feeling practically ceremonially, with its teases of surf guitar, this is a wonderful vibe to end up on. An excellent showcase of the modern dub dancehall, the fact two pillars of rhythm provided the drums and bass only enhances this album’s importance.